A lot has been made of Twitter for the past 2-3 years and the growth of Twitter has been astounding. Marketers were quick to find ways to leverage (exploit?) Twitter. Despite all of the desires of marketers, Twitter as a marketing platform has not turned out to be the next magic bullet. What Twitter has turned out to be, however, is a valuable channel for PR.Twitter is also, increasingly, a source for "live news". The news of Michael Jackson's death first spread on Twitter before major news agencies confirmed and broadcast the story. The news of Twitter spreading the Jackson story before the news agencies became news itself. Twitter has become so influential that search engines have started to create "real time search" results based heavily on Twitter tweets. Yet for all the growth and buzz on Twitter, only one metric remains top of mind for measuring "success" in Twitter: number of followers. Perhaps it's how the website itself is set up that causes people to gravitate towards comparing how many followers a Tweeter has compared to how many tweets he/she has made. Or perhaps people really believe that followers really does mean true audience. Or perhaps it's the popularity or celebrity factor such as Ashton Kutcher's famous challenge CNN to see who could capture 1 million followers on Twitter. Kutcher won. Whatever the case is, collecting followers seems to be the most coveted metric to gauge Twitter success. But a recent report found that the average Twitter account has 300 followers and follows 173 accounts. Now let's factor in some reality mixed with ideal assumptions and crunch some numbers. According to a 2005 survey from Microsoft, the average US worker receives 56 emails daily. This is all just reading and not responding. If the worker responds to emails then more time is spent just on emails. It's a good bet that the emails received don't get 100% reading or opening rate. But, assuming that workers read every single email per day, at 56 received emails, following 173 Twitter accounts and assuming one tweet per day would be equal to reading 3x the amount of daily email! Are people really THAT passive to soak up everyone else's tweets? Let's look at another bit of research data. A recent survey found that 40% of tweets are "pointless babble" and 38% are conversational. If 38% of the tweets are conversational, let's assume that the tweet conversations are 1:1, that is, one tweet to a follower, one tweet back. Let's also take the average of 173 active follows (we're using this number because it is the active follow, the rate at which a Twitter account actively followers other Tweeters). At that average rate, if 38% are conversational and thus engaging, the REAL follow rate is not 173 followers but 65. But we are making some very very basic assumptions here. The reality is that most Tweeters tweet more than once a day. Another survey suggested that 22 tweets per day may be the sweet spot between maximum output messaging and maximum followers. Still, another survey found that nearly 92% of Twitter users tweet once or twice a day. If the average Twitter account actively follows 173 accounts but tweet once or twice, how can you gauge reach or engagement? This really begs the question - does the number of followers REALLY matter? As a metric, if we are only concerned about popularity, then the number of followers is the natural measure of success on Twitter. But the number of followers on a Twitter account can be inflated! There are already commercial services for increasing Twitter followers. These services help increase followers but many of those followers also drop off. 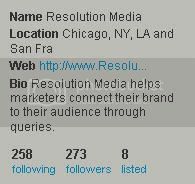 If these followers drop off and are gained through "artificial" means, is it a reliable metric? What is to prevent people from creating several ghost accounts to inflate followers? Twitter tries to be vigilant to prevent this by suspending accounts with "suspicious" activities. Yet all of these issues, for marketers, begs the question - what is the true value of "followers"? For marketers and any company or person looking to gain real value from Twitter, having a captive audience is more important. But how do you gain a captive audience and more importantly, how do you measure that audience? There are two main metrics that reflect how much audience your tweeting has captured. Retweets (RT) are tweets from other Twitter users that copy and echo what you previously tweeted. Mentions (@Twitteruser) are "shout outs" from one Tweeter to another, usually in response to a previous tweet or tweet conversation. Why are retweets and mentions important as metrics? These two metrics show and demonstrate an active, engaged audience. Only a Tweeter who has taken time to read your tweets will respond with a retweet or a mention. A retweet, however, is better than a mention because the retweet essentially repeats what you wrote. When someone retweets, Twitter or the Twitter app being used automatically mentions your Twitter account. RT@twitterRM: Worker bees can leave. Even drones can fly away. The Queen is their slave. @twitterRM you just got that from a movie! A mention may not include your original tweet whereas a retweet typically includes the original tweet along with commentary, if there is enough character space. There are tools that measure the number of retweets that each tweet receives. Retweet.com is one website that measures the number of retweets that a particular tweet has. It also is easily interfaced with Twitter and offers an easy-to-use "retweet" button to place on content pages. Another measure of Twitter audience capture is the click-through on tweeted links. Because of the 140 character limit on Twitter, it is important to shorten web URLs. A number of URL shortening services exist. TinyURL, Bit.ly, Ow.ly, and many others all product different shortened URLs. Tools like Retweet.com is useful for measuring the number of retweets. But Tweeters don't always retweet and often, using different URL shortening services break up the count of retweets. If you relied on only one metric for measuring your tweets' reach, you would lose a lot of information. But if you measure how many times Tweeters tweet about your destination URL, regardless of the URL shortening service, you can measure the CTR rate to your landing page. Twittur(ly) is one service that measures the destination landing page rather than tweets, mentions or retweets. This is particularly useful to measure the actual "impressions" your landing page has on Twitter and compare it to the actual number of visits to that landing page. For marketers, measuring how many retweets and mentions our tweets have, is a powerful gauge of how much engagement our Twitter campaign has. Coupled with the ability to measure landing page "impressions" on Twitter through how often our landing pages are tweeted through various URL services, we get a far clearer picture of our campaign. When you look at both of these tools and use them together, you get a far more complete image of the reach and audience of your tweets and your Twitter campaign. These are far better and far more useful than comparing how many followers your Twitter account has. Be sure read this post and follow Resolution Media @ http://twitter.com/ResolutionMedia. Tweet and retweet this post (we'll be watching)!